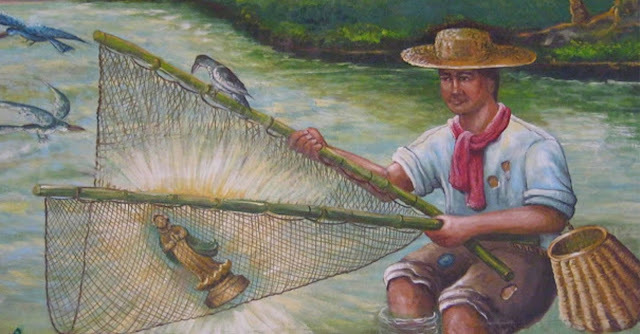 Juan Maningca fishing the image from the river as depicted by a fresco at the Our Lady of Caysasay Shrine. Image credit: By Eric Jam - Own work, CC BY-SA 3.0, https://commons.wikimedia.org/w/index.php?curid=30978535. The confusion stems from the title for the entire paper, “Magic Tales from Cuenca,” not just the short legend included in thi article. It may not be entirely accurate or wise to simply assume that the story was set in Cuenca just because there is a locality of the same name in the town. It is possible that what Cuevas really meant was that the so-called magic tales were being told in Cuenca, but not necessarily set in the town. It is also possible that the story was originally told about the well in Labak, Taal; but adapted to the local setting; i.e. to Cuenca's own barrio called Labac. There was really a by-now forgotten well in Cuenca where this story was really set. The author Cuevas probably passed on years ago, since the paper was written in 1925. Therefore, we will probably never know what his intentions were in including the story in supposed tales from Cuenca; or if the story was set in Cuenca or in Taal. That said, at the end of the day, the important thing is that the story is brought to the attention of a contemporary audience instead of being stashed away accumulating dust in some shelf at the National Library of the Philippines. From an ethnographic paper written1 by one Agripino R. Cuevas in 1925, we get a curious tale of the allegedly miraculous Our Lady of Caysasay. The story is curious because its setting was in the barrio of Labac in the town of Cuenca, Batangas; instead of in the town of Taal with which the Our Lady of Caysasay, up to the present day, is often associated. As rather tended to be with these ethnographic papers that were written by students of the American professor Henry Otley–Beyer, this story also lacked refinement stylistically. These papers are nonetheless rich sources of information about Filipino culture during the American colonial era. The myths, legends and other stories, while generally not well-written and tended to be rather shallow, are nevertheless published in Batangas History because they are otherwise forgotten. Cuevas’ story, which he titled “The Well of the Virgin of Caysasay,” is published verbatim but for grammatical corrections here and there. Annotations are provided where this writer finds it necessary. Once there was in the small barrio of Laboc [Because the title of Cuevas’ papers was “Magic Tales from Cuenca,” we presume that Laboc was a typographical error and what Cuevas actually was referring to was the barrio of Labac, instead.] a deep well known to the people of that neighborhood as the well of the Virgin of Caysasay. It is said that the water taken from that well is of such a value that it not only cures all kinds of sicknesses, but that it also possesses some miraculous or magical property. For example, if one has lost something, say a carabao or a plow and the owner can’t locate the lost object at once, by filling a clear transparent glass jar with water taken from the well, the place where these lost objects are hidden, is clearly reflected on the surface of the water on the jar, so that the owner could easily recover them. Besides this, if the lost properties are suspected to have been stolen, by just asking who the thief was, his face will also be revealed on the water’s surface. Even the moss that grows on the inner wall of the well is believed to possess a magical power, so much so that if a piece of it is ground in a mortar with any kind of oil, but preferably the “calumpang oil,” [The calumpang tree is also known as the wild almond and is considered medicinal2.] and the extract that is obtained from the said process is sprayed or mixed with the water of fish ponds, it will cause the fishes in it [the pond] to grow so rapidly that within a period of scarcely 24 hours, each small individual fish will suddenly become big enough to fetch a marketable price. Besides the water and the moss, also the sediment that collects at the bottom of this well has a marvelous healing power. An interesting story is told about this. It is said that there once was a fight between two brave men of that barrio. It was a bolo duel. Both [men] were strong and well-bodied; but one of them was “one-eyed.” As they began to strike each other, the one-eyed fellow, due perhaps to his disadvantage of fighting only with a single eye, received a blow on his neck with such a force that he was nearly beheaded. A younger brother of his who happened to be present in the fight did not lose time to approach his dying brother and by applying a kind of poultice to the wide cut inflicted by his opponent’s bolo at his brother’s neck, the latter easily got up to continue fighting, for his wound had miraculously healed up without leaving any trace of a scar. The fight continued and each time that this single-eyed fellow received a cut, his brother applied the remedy [i.e. the poultice, to the wound] so that in the end he succeeded in killing his adversary. Upon inquiry, the people who watched the fight learned that the remedy applied was nothing more than the fresh sediment taken from the well of the Virgin of Caysasay. 1 “Magic Tales from Cuenca,” by Agripino R. Cuevas, 1925, online at the Henry Otley Beyer Collection of the National Library of the Philippines Digital Collections. 2 “Calumpang Tree (Wild Almond) and Kalumpit Fruit,” online at Healing Galing.